Apparently Joel Hills Johnson was not satisfied with the newly forming town of Johnson in Kane County, for he shortly left and settled in a broad area of northern Long Valley. 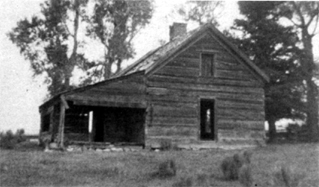 He finished the construction of a sawmill on the Sevier Ricer to supply lumber for the twenty families which had followed him into the area in 1871-72. The town was named Hillsdale in his honor and he became its leading citizen for many years. Because of the elevation, almost 7000 feet, the usual difficulties with high altitude farming were encountered and the townspeople turned mostly to hay and dry farming and livestock raising. In 1886 many of the 30 families then living in town began drifting away, discouraged by the cold climate, water uncertainties and survey reports which revealed many of their lands overlapping. A handful of people stayed on for another 50 years, running small cattle herds. In 1941, 25 residents were found and school was still in session. The town and valley continued to be used as summer grazing lands. The old village is right along U.S. Highway 89 about 5.7 miles north of Hatch, and 9 miles south of Panguitch. Several very photogenic old frame and rough sawed log houses, barns and sheds dot the rich grassy meadows. One house, with evidence of a paint job some 30-40 years ago, still is occasionally occupied. One enterprising landowner some 15-20 years ago brought in some intact motel units intending to take advantage of the Bryce Canyon tourist traffic. He either ran short of funds or thought better of the idea after all, as the cement block buildings appear never to have been used after they were hauled in and plunked down by the river. This atrocious addition to a very charming ghost town spoils an otherwise beautiful setting. Fortunately, this miserable motel can be excluded from any photography. Several old deserted houses make up the ghost town of Hillsdale. a lot of snow each winter. © 1972 by Stephen L. Carr, M.D.